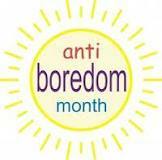 July is National Anti-Boredom Month! Did you know July is National Anti-Boredom month? Come into Leisure and let us show you how ANTI-BORING Camping with the family is! Let us help put you in your dream trailer – just think….Hiking, biking and swimming with the kids all day; then you come back to your campsite, sit next to a cozy fire, gaze up at the stars and create great family memories. What better way to spend your summer than that! !